International Magnetic Map Country shaped refrigerator magnets are one of a kind souvenir items that will bring back fond memories of your trip to Europe. Still planning that vacation of a lifetime? Since anticipation is a big part of an experience, put these fridge magnets up to remind you of the adventure to come. They also make an excellent educational souvenirs or gifts for the kids in your life. To help them learn the location of each country of Europe, click here for a free printable blank map of Europe. 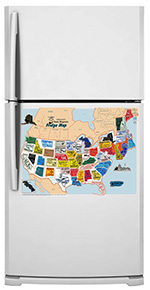 International Magnetic Map Country shaped refrigerator magnets are 3 dimensional, flexible, molded magnets that are 3 square inches in size. They feature the country's flag, capital and more. Made in the USA. Ships the business day after an order is placed.